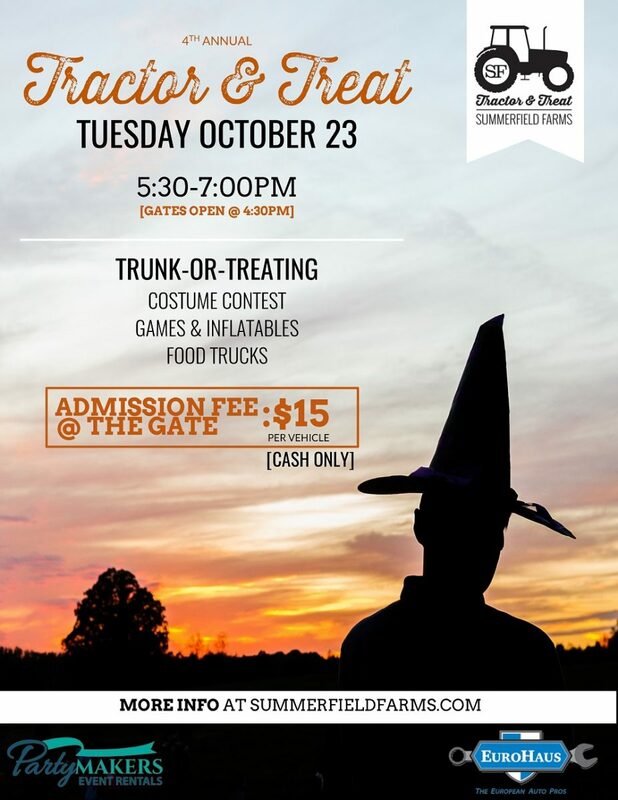 Summerfield Farms 4th Annual Tractor & Treat will be on Tuesday, October 23 from 5:30-7:00pm! Admission fee is required upon entry. Safety of all guests is our #1 priority. To ensure safety, no walk-ins will be accepted. All guests must enter through the main event entrance to be admitted into Tractor & Treat. There are 2 additional parking lots this year so there will be plenty of parking available. We welcome you to join us for the “pre-party” at 4:30pm to get parked, enjoy delicious food trucks, smores around the fire pit, games and shop in The Market. 🍁 Enjoy trunk-or-treating, inflatables, food trucks, tractors & farm equipment, s’mores around the fire pit, hot cocoa & apple cider, shopping in The Market, photo booth, costume contest and more! 🚗Parking is first come, first serve. Parking is still limited but we are opening up new parking lots so have DOUBLE the parking. Parking will be NO EARLIER than 4:30pm. 🚧 Gate opens at 4:30pm for pre-event activities. Trunk or Treating begins at 5:30pm. DO NOT ARRIVE BEFORE 4:30pm. 💵 Admission is CASH ONLY at the gate. All vehicles are $15. 👻 Costume Contest is at 6:30pm in The Barn with multiple categories. 🍏 Bring 5 or more food items to donate to BackPack Beginnings and be entered into a raffle for an overnight stay at the farm. This event is powered by EuroHaus!